If you’re not in the know, the statistics are out! 57% of the workforce plans to look for new jobs this year and niche staffing agencies are the key to attracting specific top talent and filling specific jobs in a time and space where there is a major talent war going on. What does this mean for you? Yes! All of these niches have a focus and it is true that there are individuals out there starting and/or running staffing agencies who truly understand the old saying “Jack of all trades, master of none.” is not the way to go, and to really impact this industry and their pockets; a dedicated focus on niche staffing leads to higher margins and profitability for staffing and recruiting agencies. Online legal staffing agencies, like Lawyer Exchange, can help pair lawyers with law firms, bringing the two together online for legal project work. The examples given above is just a small example of what Staffingpreneurs out here are doing (yes, these are real people and real staffing agencies) and I would like to open your mind to the opportunity of starting your own recruiting and staffing agency business. SIGN UP FOR LIVE FREE WEBINAR ON STARTING YOUR OWN NICHE RECRUITMENT & STAFFING BUSINESS HERE! If you’re tired of your job but want to stay in the industry, this is a great business opportunity for you. Learn what it takes to get started with little to no staffing industry experience, how to get payroll funding, job orders and how to find job seekers that are a right fit for the hiring manager, job, and company. Learn how you can leverage the challenges that these larger agencies are experiencing, how you can help employers and job seekers today, and really impact our economic infrastructure at the same time. Seriously, if 57% of the workforce plans to look for new jobs this year, don’t you want to be the one to assist them? It’s easier than you think. It’s time to shake up the recruiting and staffing industry! 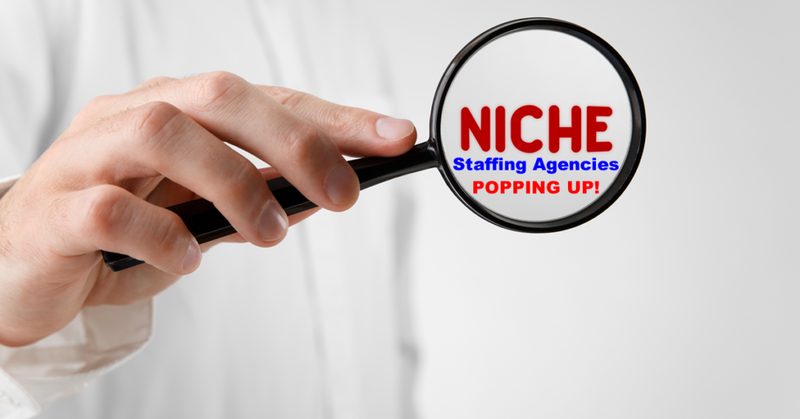 0 Comments on "Niche Staffing Agencies Are Popping Up Everywhere!"